Do your employees understand the Fundamentals of Rigging? ProservCrane Group now offers Rigging Training at your place or ours. Question: Do you require a minimum number of attendees for your Rigging Seminar? Question: Do you have a maximum number of attendees for your rigging seminar? Question: How much does the rigging seminar cost? Answer: Price for the seminar is based on seminar location, volume of seminars, volume of attendees etc… Please contact us for a free consultation. Question: Will the attendees receive any training material? Answer: YES! Each attendee will receive a Crosby Product Application Seminar Workbook as well as a Crosby Users Guide For Lifting Rigging Card and a Certificate of Attendance. Question: What will I learn in the Rigging Seminar? Question: How long is the Fundamentals of Rigging Safety seminar? Question: How many attendees from my company can attend? Answer: There is currently no cost for this class (limited time only). Question: Will I receive any training material? Answer: The Fundamentals of Rigging Safety Seminar is about 4 Hours long. After the class, we will provide lunch and a tour of our facility. Plan spending about 5 ½ hours with us. 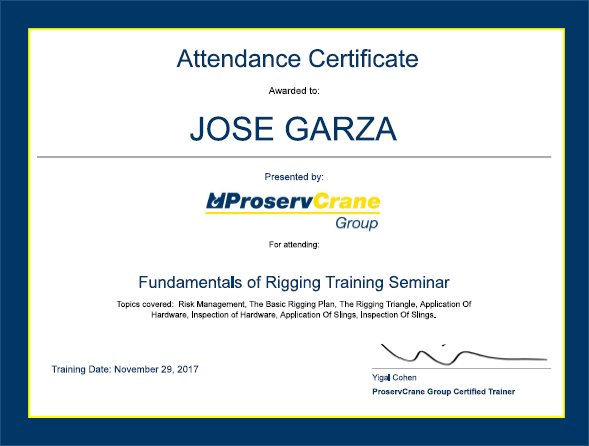 ProservCrane Group is excited to announce the 2018 “Rigging Fundamentals” training schedule to be held at one of our facilities. Come join us for an exciting day of learning how to properly SELECT, INSPECT and USE Rigging Slings and Rigging Hardware.